Word that Republican Jon Huntsman is considering a return to his former job as governor of Utah adds yet another big name to the list of rumored GOP candidates who may vie for their party’s nomination to the state’s highest elected office. No major candidate has yet formally announced a bid, but several have shown interest including Lieutenant Governor Spencer Cox, state Attorney General Sean Reyes, state Auditor John Dougall, former U.S. Representative Jason Chaffetz, congressman Rob Bishop, and former state House Speaker Greg Hughes. [Though few are expected to get in the race should popular Governor Gary Herbert unexpectedly reverse course and run for a third full term]. If Huntsman does run and win, he would become the first former Utah governor to return to the office in state history. Huntsman exited the governorship in August 2009 after being confirmed to serve as U.S. Ambassador to China under Barack Obama. Lee was also the Conservative Party nominee for president in 1960. More than two-dozen former governors have come back to win gubernatorial elections over the last half-century including Alabama Democrat George Wallace (in 1970 and 1982), Alaska Democrat William Egan (1970), Virginia Republican (and former Democrat) Mills Godwin (1973), Ohio Republican Jim Rhodes (1974), New Mexico Democrat Bruce King (1978, 1990), Oklahoma Democrat George Nigh (1978), Missouri Republican Kit Bond (1980), Arkansas Democrat Bill Clinton (1982), Massachusetts Democrat Michael Dukakis (1982), Minnesota DFLer Rudy Perpich (1982), Louisiana Democrat Edwin Edwards (1983, 1991), West Virginia Republican Arch Moore (1984), Idaho Democrat Cecil Andrus (1986), Oklahoma Republican Henry Bellmon (1986), Texas Republican Bill Clements (1986), Alaska Independence nominee (and former GOPer) Wally Hickel (1990), Vermont Republican Richard Snelling (1990), North Carolina Democrat Jim Hunt (1992), Alabama Republican (and former Democrat) Fob James (1994), South Dakota Republican Bill Janklow (1994), West Virginia Republican Cecil Underwood (1996), California Democrat Jerry Brown (2010), Iowa Republican Terry Branstad (2010), and Oregon Democrat John Kitzhaber (2010). Unlike Huntsman, most of these aforementioned governors were term-limited or lost their gubernatorial seat in between their two (or more) stints in office. 3 Comments on "Will Jon Huntsman Make a Historic Return to Utah’s Governorship?" 1. Goerge Patterson Nigh ascended to the governorship on TWO occasions, serving out the unexpired terms of James Howard Edmondson (early 1963) and David Lyle Boren (early 1979) – in each case ensued by the US Senate ambition of his predecessor. He and DFLer Perpich won GUV elections after prior services as UNELECTED governors. 2. Has any UT governor served longer than 12 years, a feat not accomplished in modern times (if ever) ? 1. Another example of someone ascending to the governorship on two occasions is Mississippi Gov. Dennis Murphree, who did so in March 1927 and December 1943, each time upon the death of the sitting governor. 2. The longest-serving Utah governor was Gov. Calvin L. Rampton, who served three full terms from 1965 to 1977. If Gov. Gary Herbert finishes his current term and retires in 2021, he would surpass Gov. Mike Leavitt for the second-longest tenure, but would fall about seven months short of Rampton’s record. Leavitt was elected to three terms and served from 1993 to 2003, when he resigned to become Bush’s EPA Administrator. Herbert has also been elected thrice, though one of those was a 2010 special election, in which he ran as the incumbent (having succeeded this article’s subject, who resigned in August 2009 to become Obama’s ambassador to China). 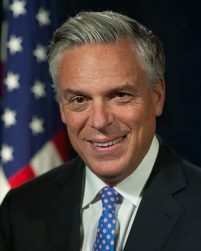 Huntsman has thus far served as U.S. ambassador to three different countries: Singapore, China, and Russia. Has someone with as much foreign experience been elected as a state governor before? Gov. W. Averell Harriman (D-N.Y.) and Gov. James F. Byrnes (D-S.C.) are the only examples that come to mind. Harriman served as U.S. ambassador to the Soviet Union and to the United Kingdom and as director of the short-lived Mutual Security Agency before his 1954 election as governor of New York, and Byrnes served as war mobilization director and as secretary of state before his 1950 election as governor of South Carolina. [Before their gubernatorial elections, Harriman also served as commerce secretary, while Byrnes also served as a prominent U.S. senator and on the U.S. Supreme Court]. Bill Richardson and Andrew Young were U.S. ambassadors to the U.N. who later returned to elected office; Richardson as governor of New Mexico, and Young as mayor of Atlanta. I hesitate to include Daniel Patrick Moynihan, who after serving as U.S. ambassador to India and to the U.N. became U.S. senator for New York for four terms; much less, the current DNI, Dan Coats (R-Ind. ), who returned to the Senate in 2011 after serving as U.S. ambassador to Germany. The Senate is a much more natural landing place for someone with a strong foreign policy skill set, so these examples are not as unusual as Harriman and Byrnes.